Drillmar Resources Limited, specialists in recruitment in the oil and gas industry, are proud new tenants at Great Yarmouth’s Beacon Innovation Centre. With more than 75 years combined management experience recruiting in the drilling contractor sector, their team of highly professional and qualified recruiters are dedicated and focused allowing them to provide quality resource solutions and services to corporate clients and employees alike. The Aberdeen-based business is delighted to be opening up the new office to complement their recruitment services in support of their UK and international assignments. This new operation will also assist their current clients within the region with their recruitment needs. We spoke to Phill Kirby from Drillmar Resources Limited on his first day at Beacon Innovation Centre. What makes Drillmar Resources Limited unique? The people, the infrastructure of the business, our resources and our response time all make Drillmar Resources Limited a unique business. 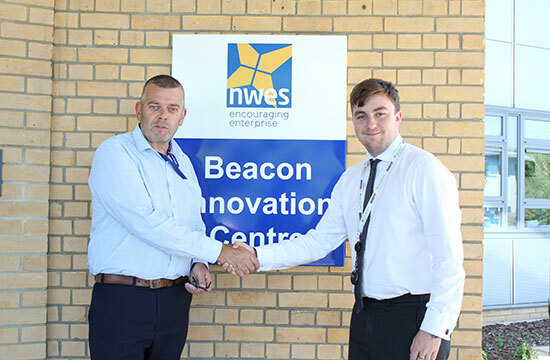 We are looking forward to working within the Nwes premises of Beacon Innovation Centre and supporting the community of Norfolk. What advantages will being based in Beacon Innovation Centre bring? The location is superb. Our headquarters is in Aberdeen and this is our first satellite office and it’s great to have a base further south; strategically this is good and of course it is better for our clients. If we want to expand in the future, it will be easy to do so without having to change premises. Tell us more about how Beacon Innovation Centre will support Drillmar Resources Limited? There are potential clients already in the building. It’s also a recognised centre within the oil and gas industry. I’ve been really impressed with the team at Beacon; there’s excellent support, everything is very professional, there’s good amenities and it’s a clean and well thought-out building. As Nwes tenants, we are also looking forward to utilizing the meeting rooms both at Beacon and other Nwes premises across the region. What has been the most helpful experience that you have had from Nwes? We’ve had plenty of support and guidance on office set up. The communication and response times from our point of contact at Beacon Innovation Centre have been great. Is there one stand-out point about Beacon Innovation Centre? Asides from the perfect location, it’s the facilities. They are both professional and recognised, which will boost our business and our profile.